It's western week this week, so I'm looking at all western movie ads. 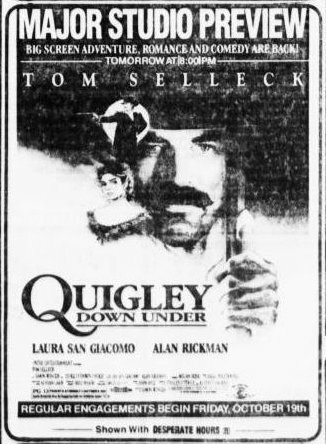 Here's an ad for the Tom Selleck vehicle Quigley Down Under. It's a great little movie with lots of humor and an awesome turn by Alan Rickman (as usual). This movie is just a lot of fun. I'm torn on Laura San Giacomo, though. I don't know if she helps or hinders the movie. Some days I hate her and some days I don't mind her. I love this movie. I thought it came out way before 1990, though. Seems like I've been catching it on Sunday afternoon TV for longer than that.